widespread resistance to a new uranium mine and processing plant in his long-time Pulivendula assembly constituency in Kadapa district of Andhra Pradesh has come as a shock to chief minister Y S Rajasekhara Reddy. People from his pocket borough have dug in against his pet project a 26.79-million tonne uranium mining project in Tummalapalle village. Particularly at issue are the strong-arm measures employed to ram it down the throats of the people. A public hearing conducted by the Andhra Pradesh Pollution Control Board (appcb) for environmental clearance at the 300-household village, Tummalapalle, on September 10 turned out to be a farce hundreds of people from the four affected villages who opposed the project were chased away from the venue. Rapid Action Force personnel were deployed in force since the morning along all routes leading to the venue to scare away protestors. Instead, hundreds of people from faraway villages, and students, were brought in by the chief minister's younger brother and Kadapa Lok Sabha member Y S Vivekananda Reddy to drum up support. Several people told Down To Earth that students of mining technology from private polytechnic colleges in Pulivendula and Proddutur, who were promised jobs, were brought to the public hearing. Strong opposition The Uranium Corporation of India Limited (ucil) will mine uranium in four villages -- Tummalapalle, Mabbu Chintalapalle, Bhoomayyagaripalle and Rachakuntapalle -- in Pulivendula assembly constituency, about 70 km from Kadapa town. It also wants a tailings pond for waste in K K Kottalu village, 6 km from these mines. The cost of the project is Rs 1,029.57 crore. A total of 45.48 million tonnes of uranium reserves with 0.0407 per cent of u 308 uranium were identified in this area a decade ago. Since ucil was busy with the Paddagattu-Lambapur project in Nalgonda district initially, it did not pay much attention to the Kadapa project. But after appcb denied clearance to the Nalgonda project, ucil set its sights on Pulivendula. After the opposition to the Nalgonda project, the people of Kadapa too were not ready to allow the project. But, as Rajasekhara was keen, his brother took upon himself the task of mobilising public opinion in favour. Vivekananda's efforts were unsuccessful even after he took 28 farmers to Jaduguda in Jharkhand to show them how safe the ucil plant there was (see 'Up against uranium' Down To Earth, May 15, 2005). If his behind-the-scenes machinations had little impact, Vivekananda's presence on the dais at the hearing too did not impress the opponents of the project, even though this area is considered to be a stronghold of the Reddy family. It must have come as a shock to the overlords to see hundreds of women swarming the dais, shouting, "We don't want this project". This would have been unthinkable a few days ago. If anything, Vivekananda's presence was an incitement. People waved a poster of a deformed boy from Jaduguda. Though district collector Krishna Babu asked the protestors not to disturb the hearing, it became clear that the proceedings were degenerating to farce. While pro-project speakers eulogised the project, protesters raised slogans opposing the project. 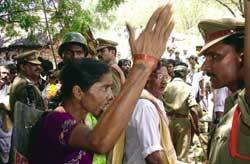 Satya Lakshmi and K Sajaya, Movement against Uranium Projects (maup) activists, were heckled. Along with them, Human Rights Forum convener K Balagopal and a few organisations, including the cpi(m)'s Revolutionary Writers' Association and a lawyers' group submitted memorandums opposing the project. maup has been opposing the Tummalapalle uranium project on the ground that it will do more harm than good to present and future generations. It says the project to mine alkaline uranium ore is neither technically feasible nor financially viable. maup alleges that the environmental impact assessment (eia) report did not qualify as a full report as the baseline data measurements were limited only to winter as against all seasons, as required for such a report. As per the eia report, the mine is expected to last for 30 years with a capacity of 3,000 tonnes per day from the fourth year of production. The project will be constructed in 36 months. However, anti-uranium project activist Surendra Gadekar found fault with the data furnished in the report. "The data, collected in just two months of the winter season, do not reflect the actual situation on the ground at Pulivendula," he said. The average quality of the ore being low, mining and processing would contaminate air, soil, underground and surface water, he added. It was left to Govardhan Rao, a senior engineer from the Department of Atomic Energy to assure the villagers that the proposed project would not cause any harm. ucil brass hinted that local people would be preferred for jobs. District collector Krishna Babu, who chaired the hearing, told media later that "barring a few, a majority of people endorsed the project". ucil chairman-and-managing director Raminder Gupta also said the people had "by and large endorsed the project". The falsity of these claims was demonstrated when hundreds of people gathered at Mabbu Chintalapalle and blocked the vehicles of Vivekananda, the collector and ucil officials, who were returning to Kadapa. People demanded a fresh public hearing. "They are bringing the project here only to cut our throats," screamed Padmavatamma. She was angry that the mp had brought outsiders to the hearing and denied them an opportunity to speak. "We are all YSR supporters, but next elections we will show our mettle," shouted Pratapa Reddy, a farmer. M Venakata Krishna Reddy, a farmer from Bhoomayyagaripalle, had been a staunch Reddy supporter. But, ever since the uranium project proposal was mooted, he has turned a bitter critic of the chief minister. "Three-fourths of our village people are Congress, but now we all oppose the uranium project," he says. It doesn't help that Rajasekhara had opposed the Nalgonda project when he was in opposition. Many villagers point to this. Even some of the "elders" chosen by the district administration to speak at the hearing could not hide their doubts about the project. M L N Reddy, a retired district medical and health official, sought a firm assurance from ucil that there would be enough hospitals to take care of future health problems in the area. Though he was supposed to back the project, M L N Reddy said "We have our own doubts; this is not any other industry, like cement or limestone. This is hazardous mining, which may have a long-term impact on our lives, so we need a higher compensation and proper rehabilitation". Another elder, Purushottam Reddy, wanted a commitment from ucil on jobs. A Congress spokesman and Rajasekhara loyalist expressed doubts over safety. He too sought an assurance on jobs. But it's not just a question of jobs. Though the price of land has gone up to Rs 3 lakh an acre from Rs 1 lakh, for farmers that's not important. "Where can we go? Thanks to a good groundwater table, we could grow banana, chilli, groundnut and other cash crops. The compensation proposed by ucil will leave 10,000 families from these villages destitute," says Rammohan Reddy, a student from Mabbu Chintapalle. But, there was no commitment from ucil on these concerns, only an assurance from the collector that "everything will be looked into". That's not good enough for those who are opposing the project. Satya Lakshmi and Balagopal have urged appcb to re-conduct the public hearing, since all those who wanted to express their views on September 10 were not allowed to speak. But the district collector and ucil have turned this demand down. "Everyone has furnished their viewpoint at the meeting," was all Krishna Babu said. But given the mood, it's possible that the dissenting voices will be heard.